Ceony has graduated Tagis Praff School for the Magically Inclined in only one year, an impressive feat that is mentioned more than once throughout the novel. In fact, we, as readers, are constantly reminded that Ceony is top of her class, super smart, and a fast learner, which probably explains why she’s so self-righteous, but it doesn’t explain why she’s the only student who doesn’t get to choose the magical trade she will “bond” with for life, apparently unlike the other students (who we never actually hear about). But Folders are a dying breed, and so the teachers at Tagis Praff decide to interfere by choosing a pre-destined path for her. Ceony decides it would be silly to waste a whole year of magic school (she’s better off as some sort of magician, albeit a lame one, than none at all), so in the first chapter, she concedes to bond for life to a trade she has no interest in. On the very first page, Ceony is escorted to Magician Thane’s "odd"cottage, where she’ll spend two years as his apprentice. I put “odd” in quotes, because Ceony frequently remarks that the cottage is odd, along with the stunningly handsome young Master Magician himself, Emery Thane. But I actually found neither to be “odd” in the slightest, especially in a world where magicians are no big deal. He seems simply reserved and his house is filled with paper, but what does she expect? You know that feeling in some stories, where you’re somehow convinced that no else in the world exists but these few characters? It’s hard to pinpoint the exact root of the feeling, but the feeling, nonetheless, is unmistakable. And this particular story, indeed, exists within that sort of vacuum. After a week or so of folding paper birds, making snarky comments, and noting her mentor's beautiful green eyes on a regular basis, Ceony leaves the house to get groceries. And for the first time, I’m hopeful that something exciting is going to happen. I want to see how she views the rest of the world (at this point, Thane’s cottage is odd, so I don’t know what she considers not odd). I even think she might run away (she threatens this in the beginning), but then there’s a chapter break and we pick up right when she gets home. Totally skipped over. Ceony briefly mentions how her family doesn't have money, how she’s grateful for getting an anonymous scholarship to Tagis Praff, and how she’s going to send money home. But we never actually learn about he family—whether she has siblings who look up to her, whether either of her parents went to said magic school (and were possibly sorted into the same house—just kidding), or even if she gets to visit her family while being forced to live in some strange man’s house for two years. In fact, there is no mention of how the ordinary world coexists with these so-called “magicians” at all. The reader gets the slight sense that magicians are totally normal and free to live amongst normal society. But that’s just it. We literally don’t see anyone other character for more than two seconds (besides the crazy lady who will eventually show up to create drama). We do know that if Ceony didn’t get a scholarship, she would’ve worked as a live-in maid until she saved enough for culinary school—although ironically, she does end up cooking and cleaning a whole lot for Magician Thane. But we don't really get to see any of this other magic in action, and Ceony barley mentions stories from magic school. She does, however, carry a random gun with her that serves as a constant reminder of her lost ambition to become a smelter. To me, paper magic is cool, and I don't know why Ceony doesn't see that from the get-go. Thane has an animated paper skeleton butler named Jonto who answers the door. He also makes Ceony a paper dog with the unfortunate name of Fennel, who can fold up in a pinch. I don’t think the book ever specifies her age, but since she’s graduated magic school on top of secondary school, I think we can assume that Ceony is over eighteen. However, her persistent angsty attitude, tattletaling nature, and teenage-like crush on Thane forms a much younger depiction in my imagination, not to mention the fact that she literally has to resist the urge to “stomp her foot” on the occasion when she can't overhear the adults’ conversation. And so, that sort of gets weird when the sexual tension between her and her 30-something mentor arises early on. YA books can be hit or miss for me. I still consider myself a young adult, but I seem to lack patience for YA novels that lean on the fact that their target audience probably won't know a good story from a bad one. I know I can't expect every fantasy novel to be the next Harry Potter, but even Twilight is entertaining in a way this book simply isn't. After the beautiful and dark-haired Lira, practiced in the forbidden magical art of Excision (magic of the flesh) shows up out of nowhere and literally steals Thane’s heart, Ceony makes a rash decision to go and save him by herself, having only studied paper magic for about three weeks. She follows Lira to a dark cavern where the dark magician claims that Thane’s heart belongs to her. Ceony finds herself having to (sometimes physically) swim through Thane’s heart, entering through doors that reveal her mentor’s deepest hopes and fears, and eventually sifting through his proudest and darkest memories to try and save him (and herself, because she’s now trapped in his heart). I found these special memories rather cliché and dull, but apparently, Ceony sees enough to finally confess her love for Emery Thane, her teacher. Of course, everything Thane taught her in those few short weeks becomes relevant to her saving him, and we won't get to hear about the struggle between age and love until book 2. Darn. Even magical worlds fit within the perimeters of their own logic. 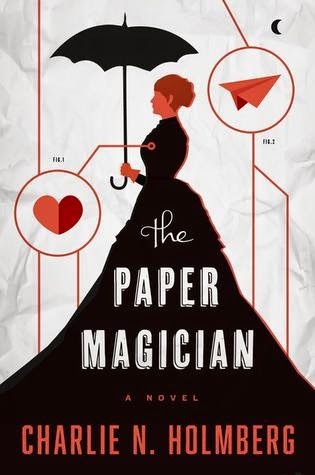 But often in The Paper Magician, the magic (or potential for magic) isn't revealed to readers until it's seemingly convenient for the characters. Ceony does eventually come around to the idea that Paper Magic is cool, but I guess the internal struggle always seemed forced to begin with. To me, there never seem to be high enough stakes, and Ceony seemingly makes brave decisions based on these unimpressive plot points. Also, the narration is repetitious at times. I wanted to shout, "We get it Ceony, you hate Folding. Move on." I always have mixed feelings about writing a bad review. After all, a human being wrote this book. And I don’t mean to pick apart the little things that might have simply appealed to me better, but after speaking to my friends at the Lone Book Club over some french toast and blue jam, it was agreed that a good YA book is simply a good book, regardless of the reader’s age. YA novels typically have a young main character and explore coming-of-age themes, but that doesn't mean the characters and their struggles have to be trivial or uninteresting. If you want to be tempted towards a good YA novel, see my review of The Absolutey True Diary of a Part-Time Indian.